Yes, I know this tart looks like a lot of onions. And it really, really is. In fact, the caramelised shallots you can see most easily in these photos rest on a bed of red onion jam (you can imagine just how good that smells). But all these onions go through a long, sweet cooking, and they're sharpened with balsamic vinegar, and paired with buttery pastry, so their indisputable onion-ness is milder and more unassuming than you'd expect. I don't know what the Tatin sisters would think of this incarnation of their apple tart; I hope they'd approve. It's not the most refined looking of tarts, but that's not really the point of a tarte tatin, which after all is officially upside down. But it looks coppery and lovely on the plate, and there's something so lavish about an abundance of one ingredient. The red onion jam is so good it's worth making a double serving and throwing it onto sandwiches or burgers, or using it as the base for pasta sauces, or eating it with cold meats, etc etc. It'll keep well in a sealed container in the fridge for a couple of weeks. To make the onion jam: heat a large saucepan over medium heat. Add olive oil and garlic and stir occasionally until starting to caramelize (3-5 minutes). Add butter, onion and thyme, increase heat to medium high and stir frequently until onion begins to collapse (7-10 minutes). Add sugar and stir frequently until onion caramelizes (2-3 minutes). Add vinegar, reduce heat to low and stir occasionally until jammy (35-40 minutes). Season to taste. Cool. To make the tarte tatin: preheat oven to 190°C / 375°F. Peel the shallots, and trim the roots without cutting off the core (you want to keep that as intact as possible, so the shallots will stay together). Cut large shallots in half lengthways. Heat a wide frying pan over medium-high heat, add oil, then shallots. * Stir occasionally, and very carefully (again, to keep the shallots intact) until golden (6-8 minutes). Add sugar and cook for 3-5 minutes, then butter. Cook, stirring occasionally, until a deep caramel colour, about 5 minutes. Add vinegar, reduce heat to low, season to taste and cook until shallots are soft (about 20 minutes). Allow to cool. Butter a cake tin or shallow circular cooking dish. The size isn't particularly important, as long as it will accommodate an 8 or 9 inch tart; you want something that's going to be easy and safe to flip over later. Carefully place the shallots in the cake tin, with their flattest sides facing up toward you. Don't spread them out to fill the tin, but push them close together in the very middle of it. Pour over the caramelised juices. Spoon the onion jam over the top of the shallots. Take a sheet of puff pastry and lay it gently over the top of the onion mound, trimming off any obvious excess and tucking the rest of it around the shallots. Bake until golden and crisp, 12-15 minutes. Cool for 5 minutes. Loosen edges with a small knife, and then - very quickly and very carefully, while wearing oven mitts - invert onto a serving plate. Serve warm. 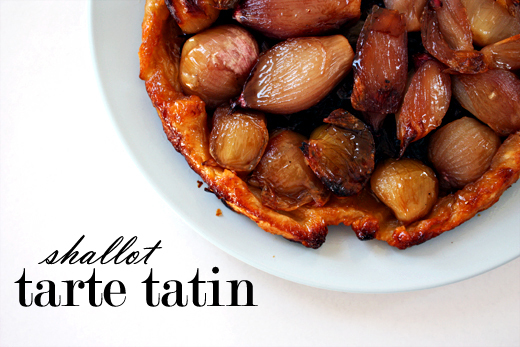 * If you have a tarte tatin dish, you can caramelise the shallots in it, then add the onion jam and pastry straight over the top. This looks lovely! I adore onion jam, though not the time it takes to make it. This is a wonderful take on the traditional apple pastry! I love caramelized onions, and shallots are so wonderful. What a stunning tart! Looks phenomenal! I have to try this now! Hi, I saw you on The Kitchn and had to come right over! This looks AMAZING! Thank you all! And welcome to my visitors from the Kitchn. Wow amazing pictures. Lovely blog, glad I found it! I made this last night- soooo good! Next time I'm making two! Oh delicious!! I came here from fresh365. I must make this! Just made this using your recipe. It is wonderful. Seriously the bestest yummy thing ever. My house smells like buttery onions. The only thing that was different is I used more like 15 shallots because they're so big nowadays. WONDERFUL recipe. Thank you! we made this for lunch and it is sooooooo delicious. i find that the sugar is slightly too much for me. I will reduce this amount the next time I make this (and this will be tomorrow!). thank you for this idea! this looks gorgeous! 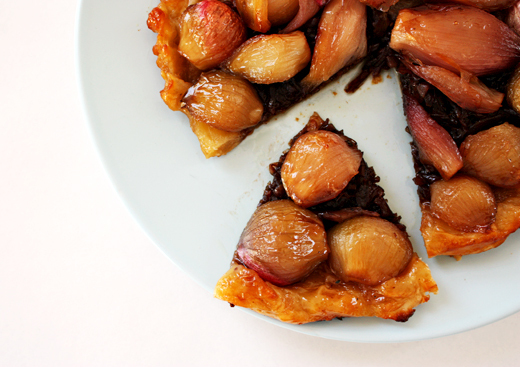 I have been looking for a tarte tatin recipe, and this one seems perfect. I will definitely try it! Oh how wonderful this sounds! 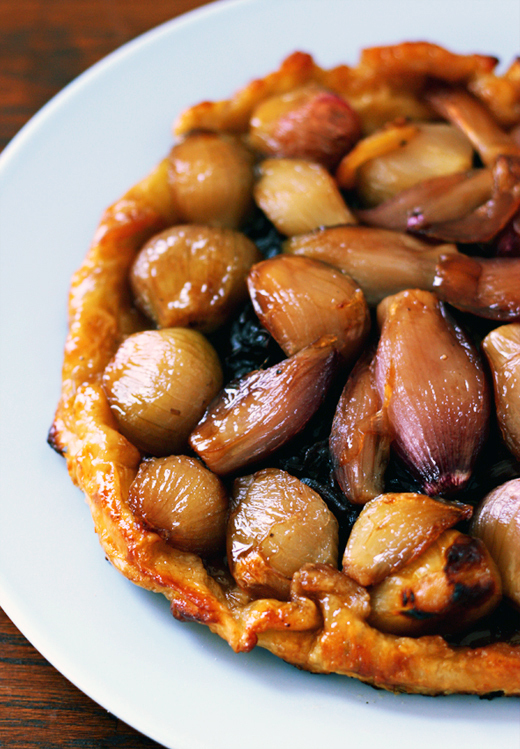 Looking for a shallot tart to serve Christmas Day. This one wins the day! Thank you.